We celebrate our sister city the week of March 22-30 in Brunswick! 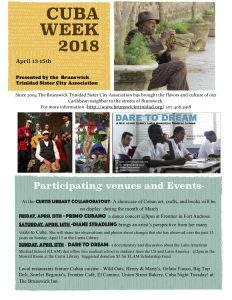 The Brunswick Trinidad Sister City association (BTSCA) is pleased to present its 16th annual Cuba Week. BTSCA is a non profit organization that promotes constructive and creative non-political interactions with the people of our sister community in Trinidad, Cuba. 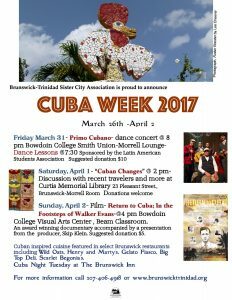 Cuba Week is sponsored annually in Brunswick celebrating the diverse cultures and common ground with the people of Cuba. The week of March 22-30 is the chosen week of 2019 for an array of activities for those interested in Cuban culture. This year, local restaurants will feature an assortment of Cuban culinary delights. Please enjoy the culinary creations at Big Top Deli, Gelato Fiasco, Henry and Marty’s, Little Dog Cafe, El Camino restaurant, Wild Oats, and the Frontier cafe. At the Curtis Library is a wonderful display in the upstairs showcase for the entire month of March. Entitled ¡Hola Cuba!, it features handicrafts, momentos, books, memorabilia and information presented for your interest. All week there will be a movie offered at the Frontier Cinema. A Tuba to Cuba was created featuring the famous New Orleans Preservation Hall Jazz Band. They retrace their musical roots from the storied city of jazz to the easternmost city of Santiago de Cuba and in turn discover a connection that runs much deeper than could have been imagined. Afternoon shows ($7) begin at 3 pm and are offered on March 22-28. Evening shows ($9) will begin at 7 and will be offered on March 24th and the 28th. Students and seniors are $8. Primo Cubano will give a salsa concert on the night of Saturday the 23rd. It will be held at the Frontier event venue beginning at 8 o’clock. This is a standing room only event with a limited number of seats to allow for plenty of dancing space. Primo Cubano plays traditional Cuban dance music dating back to the turn of the 20th Century. Son is the most popular style to come out of Cuba and is the primary contributor to the blend of Latin styles today known as Salsa. This is often a sold out show so get your tickets early! Enjoy the music and the dancers! To wrap up the week there will be an informative panel discussion Sunday,March 24 at the Curtis Library featuring recent travelers from Cuba and members of the BTSCA. It will be open free of charge to the public from 2-4. You are invited to bring your comments and questions. Yes, you can go to Cuba! The Cuba Caravan message is making its way around the U.S. this month, with welcoming events in dozens of cities. On Saturday April 22, it will be in Brunswick Maine, hosted by the Let Cuba Live Committee. Pastors for Peace National Caravan Coordinator John Waller is the speaker for this event, which will also feature Cuban food and a short film “All Guantanamo is Ours”. Waller has coordinated 10 caravans prior to this year and he has visited Cuba 15 times since 1991. He was formerly part of the national leadership of the British Cuba Solidarity Campaign before coming to live in the US. For 25 years Pastors for Peace has been bringing the message “End the Blockade” to community leaders, legislators, students and activists. Each year they create a Friendshipment Caravan to Cuba in July — this year’s trip will include Guantanamo. Their commitment to solidarity continues. Please plan to join us in Brunswick to learn more. Saturday, April 22, 5 – 7:00 p.m. The Brunswick-Trinidad Sister City Association (BTSCA) is a non-profit organization that promotes creative and constructive non-political interactions with the people of our sister community in Trinidad, Cuba. BTSCA has been celebrating their relationship with Trinidad, Cuba in Brunswick since 2004 by having “Cuba Week.”. During this annual celebration the Brunswick Trinidad Sister City Association works with town businesses to bring the flavors and sounds of our Caribbean neighbor to the streets of Brunswick, Maine. This year’s festivities will take place during the week of March 26 until April 2. There are a number of activities to celebrate the Brunswick- Trinidad relationship. All events are open to the public. For the entire month of March the Curtis Memorial Library will display a case of Cuban arts and handicrafts. These items provide interesting insights to the many creative talents of the Cuban people. The Gulf of Maine Books will have an array of Cuban literature in their store on Maine Street. A dance concert will be held by Primo Cubano at Bowdoin College in the Smith Union Morrell Lounge on Friday March 31st at 8:00. Before the concert salsa dance lessons will begin at 7:30. Primo Cubano is well known for their crowd pleasing Cuban tempos bringing fans to their feet. Suggested donations for this event is $10. On Saturday, April 1 a panel discussion at the Curtis Memorial Library in Brunswick (2-4 pm) will bring insights of culture and personal traveling experiences. This free event is open to all who would like more information or to share information about experiencing Cuba. Also find out more about BTSCA activities by attending this meeting. On Sunday, April 2 at Bowdoin College at 4pm in the Beam Classroom of the Visual Arts Center there will be a movie shown- “Return to Cuba: In the Footsteps of Walker Evans”. Producer, Skip Klein, will be on hand to discuss the movie and share his thoughts of creating this award winning film. This intriguing documentary highlights the work of the legendary Walker Evans, an American photographer from 1930’s who created some of the most iconic photography of the time. Five current stellar photographers travel to Cuba to present a new perspectives of Evans’ scenes of Cuba. “…these master photographers reinterpret Cuba for the 21st century. This colorful documentary brings together five unique visions of Cuba’s complex and transforming cultural landscape.” For more information on the movie, review (http://inthefootstepsofwalkerevans.com/). The suggested donation for this event is $5. At all three events an original artwork donated by Pilar Tirado will be available for silent auction to be finalized on Sunday April 2nd. This work, by a Cuban artist, is created with mixed media encaustic. It portrays the central square of Trinidad on a rainy night and is framed, ready to hang. Restaurants around town will bring the hospitable island to Brunswick with delicious dishes. The Gelato Fiasco will feature a Mojito Sorbetto. Wild Oats, whose chef recently came back from Cuba, is excited to offer a Media Noche panini, Ropa Vieja soup, a Cuban Chili, rice pudding, a Black Bean & Mango deli salad, and Rum Cake. The Brunswick Inn will have a prix fixe “Noche Cubano” on March 28 featuring the following menu- Black bean soup, a ceviche of white fish with island flavors, a choice of Lechon Asado (roasted pork in a citrus marinafe) or Camarones Aji Amarillo (Chile rubbed Shrimp) and dessert for a well valued $40 each. Other participating restaurants like Henry and Marty’s, Scarlet Begonias, the Frontier, El Camino, Big Top Deli and Big E! will have Cuban culinary specialties. The Brunswick Trinidad Sister City Association is happy to welcome and include these associate sponsors of the 14th annual Cuba Week from Bowdoin College- the Departments of Romance Languages and Literatures, Latin American Studies, and Visual Arts, and the Latin American Student Organization (LASO). 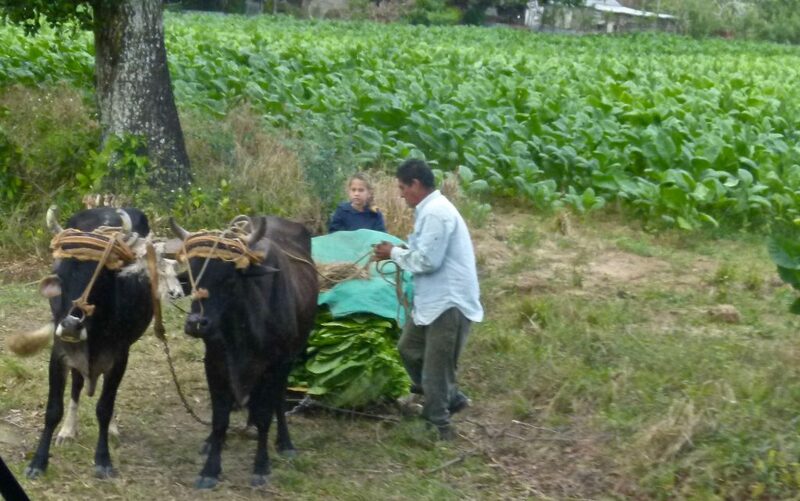 For more details, information about Cuba Week, please check out the BTSCA website http://www.brunswicktrinidad.org/ , call 207-406-4918 or like us on Facebook- Maine to Cuba Connections.